There's nothing quite like the joy of unboxing a brand new game system and breathing in that brand new game system smell. Here's what you can expect to come packed in the North American Nintendo 3DS box. Although the game console was introduced in 2012, you can still buy a new 3DS. SD Card (Inside the 3DS): A removable 2GB Toshiba SD card serves as a flash drive for the Nintendo 3DS. Certain game data is saved to the SD card, but not saved files, which are saved directly to the game card. Photos and music in AAC and MP3 formats can also be saved to the SD card. 6 Augmented Reality Cards: AR cards are used with some of the games that are preloaded on the Nintendo 3DS system. Some games such as "Nintendogs + Cats" use them for bonus content. Don't lose them. QuickStart Guide. This guide acquaints you with your Nintendo 3DS in record time. Operations Manual. This in-depth guide to your Nintendo 3DS and its features is printed in three languages: English, French, and Spanish. Charging Cord. 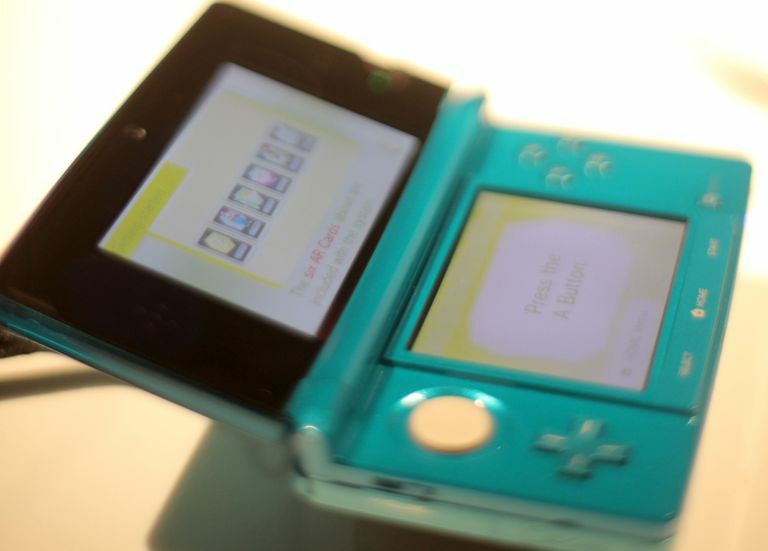 The 3DS uses the same AC cord as the Nintendo DSi and the DSi XL. You can play your 3DS while it's charging. Charging Cradle. The charging cord for the Nintendo 3DS can plug directly into the unit itself, or you can plug it into the charging cradle that comes packed with the handheld unit. Club Nintendo Offer: This paperwork informed users about how to register the Nintendo 3DS online for a free warranty extension and other rewards. Note: Club Nintendo was discontinued in June 2015 and was replaced by My Nintendo. Literature on StreetPass MiiPlaza. The flyer explains how to use StreetPass MiiPlaza, a preloaded application that allows players to meet other players' Mii characters. Subscription Offer for Nintendo Power Magazine. You don't need to bother with this. The last issue published in December 2012.